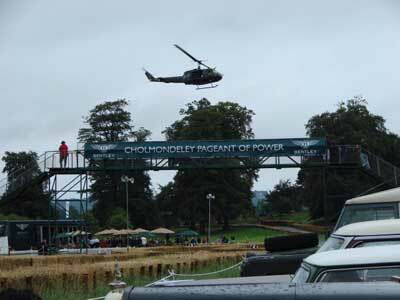 Cholmondeley Pageant of Power sounded like a rather interesting event when we heard about it. There was to be a collection of classic racing machines right through the ages from the very earliest to the most modern from Formula One, Le Mans to saloon car racing. Likewise, motorbikes from across the decades. There was also powerboat racing to take place on the Mere on this South Cheshire Estate. A 1.2 mile track had been especially laid for the event with a couple of chicanes put in place to keep the speed down for safety sake. Amongst all this they had arranged for helicopters to 'fly in' over the weekend with some displaying, hence our invitation and involvement in the event. 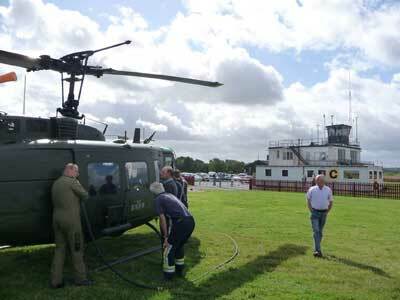 It was to be a crew of six for this weekend with Keith Thomas being the Display Pilot for this event (Keith being the latest recruit to the Huey 509 Crew) along with Phil. 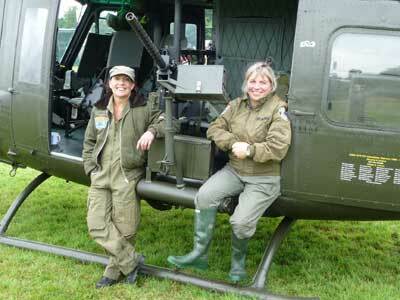 The original ‘Miss Jo’ was to fly down with them along with Nina whilst Bradley and I drove down to get to know the lie of the land, set up the tent and to be on site for 509's arrival. 509 was packed with the machine guns and also would be loaded with the ground wheels. Bradley and I arrived at Phil's early Friday morning and pushed 509 on to the pad with the jeep which would mean a quicker departure the following morning. With all the gear packed into the trailer and the Navara Brad and I set off to Cholmondeley. A little over an hour and fifty minutes later we pulled up on site and made contact with John Pattinson, Event Organiser, who showed us where we were to be for the weekend. For a man with so much going on he seemed remarkably laid back about the whole affair, nothing seemed to ruffle him. He explained to us about the display area and gave us all the passes we needed for the weekend. In a relatively short time we had the tent erected and the truck and trailer sited. As we were doing this the weather bucked up and it was really quite warm in the sun. Once happy we set off to check out the site and to have a look at the vehicles in the paddock. What a sight to behold. 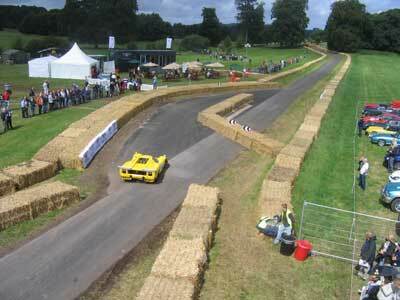 Two blower Bentleys, the latest Le Mans Jaguars, a Le Mans GT40, Ferraris, Alpha Romeos, Aston Martins…..just amazing! There was a similar display of motorbikes from the all ages…. BSA's, an AJS, Matchless G3L, Honda's, Yamaha's. But the best part was there were no barriers to keep you away, they were there for you to just get close and admire. After a leisurely stroll we headed out to Whitchurch to buy in provisions and to get our evening meal. We settled down with our food and a drink and put on a DVD which we watched on the TV we had taken with us. Camping at its best! We spoke to Phil to let him know we had arrived and were able to talk him through just exactly where we were. We had been sited at the end of the helicopter air display area and next to the Army Historic Flight who flew in their Bell 47. 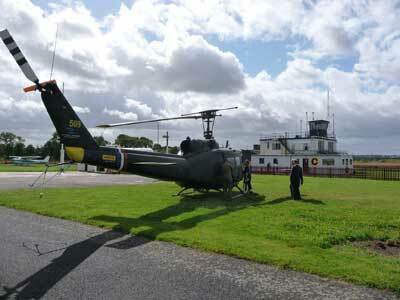 Next to them a Squirrel and a Bell 414 Griffen from the RAF flight training school at Shawbury. Brad and I retired early as we were expecting 509 at around 7.45 on Saturday morning. Up early the weather didn't look too good but it was ok for flying. Once again we put a call in to Phil to check all was ok. He reported all was well and that they would be lifting around 7.30 a.m. 'ish which would mean arrival at around 8 o'clock. Forewarned we sorted out breakfast and were on the landing field with the Marshalls warned to stop any vehicle movements on the road during the approach and landing. 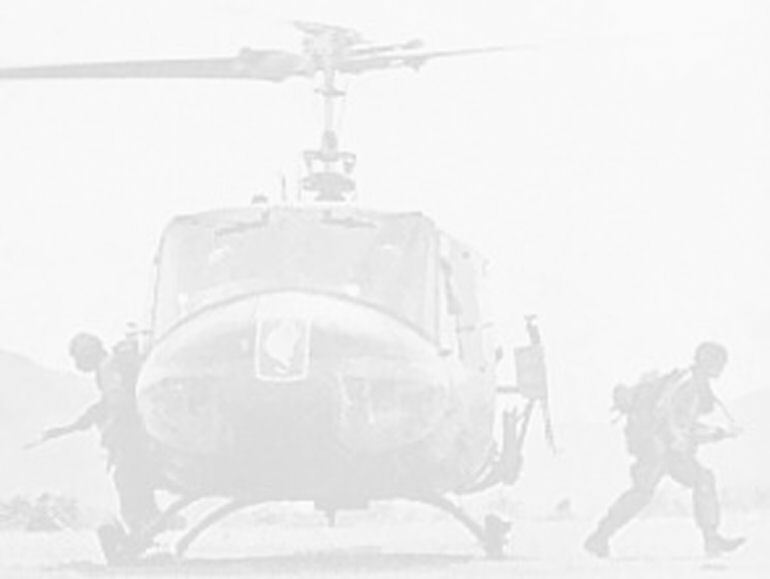 Shortly after 8 o'clock the signature thump of the Huey's big blades could be heard flying in from the north east having transited down the low level corridor. 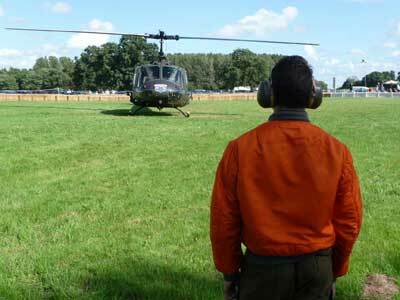 The approach to the landing site involved a high hover over the tall trees at the north of the field. Keith eased 509 over the tops of trees and followed Bradley guiding him down. Everyone who had been busy with their last minute preparations had stopped what they were doing to watch the Huey arrive and land. Almost as soon as the rotors stopped the rain arrived. We all retired to the tent to take shelter and an obligatory mug of tea was handed out to everyone. Even with rain coming down there was a steady stream of people having look at 509. I donned my wellies and waterproofs and ventured out to have a chat to those that had braved the weather to come and have a look. Despite the incessant rain there was a steady stream of visitors to talk to. As the morning progressed it started to try and clear so we fitted the 50 cals and started to prep 509 for her display which Keith was flying, though we had put it back by an hour. We had also been asked by the Pageant Organisers if we would do the ‘Tennis Ball Drop’. Dennis Kenyon was originally going to do the drop but had to pull out as his helicopter had a problem with the main rotors. Tennis balls had been sold to raise money for the North West Air Ambulance (a charity we champion wherever possible as our regulars know) and were to be dropped from the air and the nearest to a set marker won a prize – the prize being a flight in a helicopter. Everyone was asking if it was to fly in the Huey; I don't think I've seen so many crestfallen faces when they found out it wasn't. The sky cleared and the crowd was moved back for Keith to lift and set up for the display. 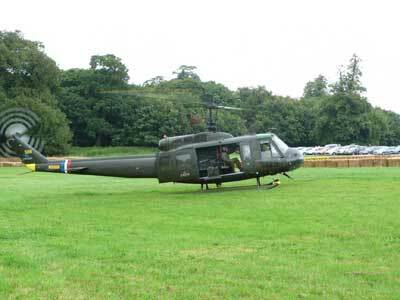 The hunt was on for the tennis balls which eventually turned up from where the Huey had taken off. Phil carried them over to me as I was told to head over to the centre of the flight line by the crowd fence where the cadets were to wait for Keith to complete the display. Keith put 509 through her paces and had fun firing off the guns and beating the air into submission. He landed slap bang in the middle of the field and Phil and I carried the dustbin with the tennis balls in to where 509 waited. We loaded the dustbin into the cabin just inside the emergency door and I jumped into the back and strapped myself in with the monkey strap. Keith lifted once again on the signal from Phil. We did one circuit and lined up on the marker in the middle of the field. Once in position I gingerly leant the bin out of the side of the Huey, acutely aware of the downwash and the effect it would have on the bin! To my relief the balls began to tumble out and down towards the marker. Happy all had gone well I hauled the bin back in and told Keith. He gently hovered us over the trees and set us down on the ground. The afternoon turned out to be much better than the morning though not as nice as it could have been but still the visitors came. All of us were kept busy talking to all those that wanted to know more. Whilst all this was going on we could see, hear and smell the cars and bikes as they roared past us. In the distance the sound of the power boats could be heard and the echoing of the commentary on the Tannoy system. As the site went quiet at 5.30 pm when the last race has finished we re-aligned the main rotors and tail rotor so we could tie them down as the forecast was for stronger winds over night. Happy that all was secure we headed off for a bite to eat and the girls went off to their hotel. Phil, Bradley and I returned to the tent and a night cap – true boy scouts! Sunday dawned a much brighter day. I set off for the Cholmondeley Farm Shop to pick up our supplies for breakfast. Jo and Nina arrived just before 8 a.m. to join us for breakfast which was all local produce and very tasty it was too. Phil was pre-flighting 509 whilst breakfast was cooking as we were to fly to Sleap Airfield to refuel and to get some aerial footage of the site for Motors TV who were filming the event. Much to the delight of the growing crowd Phil, Keith and I climbed on-board and wound her up with Bradley Jo and Nina keeping the crowd back out of harms way. After a couple of circuits for my filming we had a short flight to Sleap to put 509 on the ground by the storage tank and the refuelling pipe. To Phil's surprise the pipe was a similar bore to those on a conventional petrol pump; it was going to take some time to fill the old girl up. As he stood there the three of us were answering questions from all those that came out for a closer look. After five resets of the pump, due to the quantity that was needed to fill the tank, Phil could get no more fuel in. 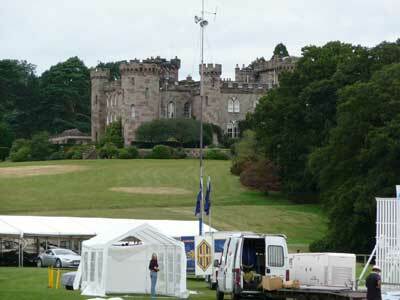 We said our goodbyes with an open invitation to return anytime and jumped in for our return flight to Cholmondeley. The weather was really looking up and the temperature rising; just as well as we were flying with the doors open so I could film with uninterrupted views. Fifteen minutes saw us back on the ground and the guns being mounted on the pedestals once again. One p.m. soon came round and Keith climbed into the front right hand seat to do the display. This time Bradley was to do the ‘tennis ball drop’ so we headed off to pick up the dustbin with them in. Keith lifted and Phil and Bradley carried the tennis balls over to the crowd fence at the centre of the flight line. 509, with a little help from Keith, managed to make rather a lot of noise to which he added the sound of the gas fired .50 cals. He dropped the Huey to the ground and the tennis balls and Bradley were put in place. 509 lifted and did a circuit before settling into a high hover for the release of the balls. Cargo dispatched Keith hovered the Huey backwards over to the landing ground. It then headed back to the display area and settled down on the ground. At which point Bradley jumped out, started to sort something out whilst Keith fired the guns. 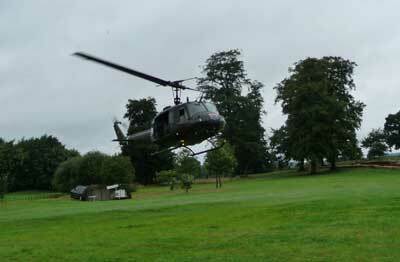 Bradley hopped back in and the Huey took off again to the high hover. All our questions were answered as another batch of tennis balls rained down from the dustbin. Now 509 came back to land, her job done. 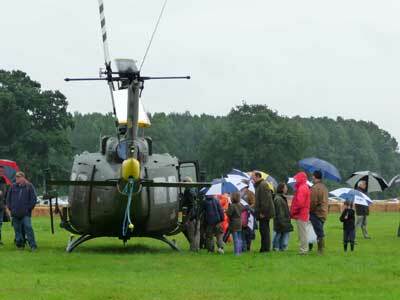 The main rotors tied down, the waiting crowds surged forwards again to get a closer look. We were all answering as many questions as we could whilst getting something to eat on the fly. The Bell 47 was flying out at 4 p.m. with the Squirrel and the 414 following on so it was decided 509 would take off after them. At 3.30 p.m. we loaded her ground wheels back in to the cabin and lashed them down along with the guns. Phil and Keith were flying her back with Jo and Nina with them.Bradley did the ground checks as the turbine was wound up and the main rotors got up to speed. Happy all was well 509 took to the skies shortly after 4 p.m. when the other three had departed. Bradley and I took the tent down and packed everything into the trailer and the truck. We were ready to leave the site when the last race finished and the access to the track cleared to let us out. By 7.30 p.m. we were back at Phil’s and everything unloaded. The end to another long and enjoyable weekend. 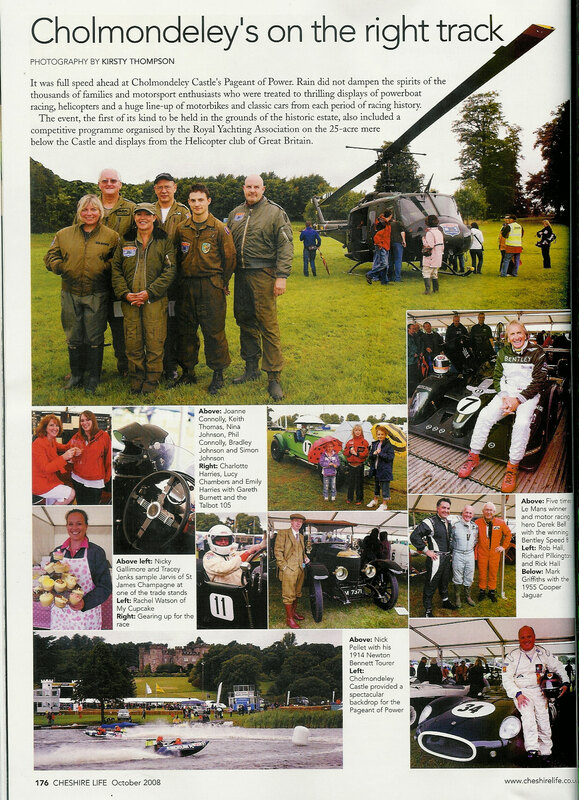 Thanks to the organisers at Cholmondeley Pageant of Power for an excellent event.